Matisse is our muse and starting off point in this intense workshop. 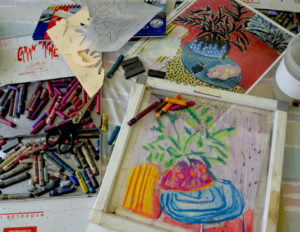 After “deconstructing” Matisse, use your imagery to explore deconstructed screen-printing, charcoal, pastels, water-soluble media and textile paint. Learn how to make the “fugitive” materials such as charcoal and pastels permanent (even washable) on fabric and how to combine them with dye printed fabrics. We will cover oh so much in our five days; plan to be completely, but happily, exhausted and full of new ideas at the end.